Product #2565 | SKU AT2020 | 5.0 (based on 1 rating) Thanks for your rating! 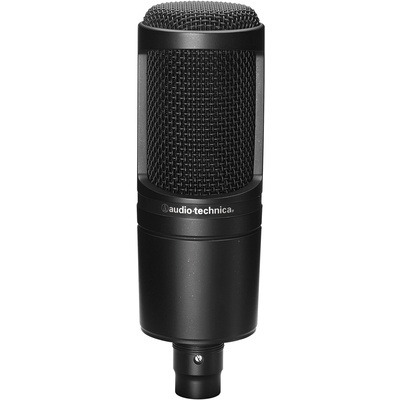 The AT2020 Cardioid Condenser Microphone from Audio-Technica is designed for vocal and general instrument capturing in project and professional studio environments. The capsule features a low-mass, side-address diaphragm with a cardioid polar pattern for rejecting ambiance and noise at the off-axis sections of the microphone capsule. A linear frequency response of 20 Hz to 20 kHz enables the flexibility to accurately reproduce signals from a wide variety of sources. High SPL handling and wide dynamic range allow the AT2020 to capture loud signals with minimal noise and distortion. The microphone includes a pivoting, threaded stand mount for accurate positioning.